The November 1924 issue of Needlecraft magazine featured “Bags for Many Uses, Desirable and Different” by Addie M. Bodwell. Instructions for making six bags—an embroidered homespun satchel, an embroidered raffia bag, an embroidered “envelope of matting,” a knitted bag, an ecru satin bag with crochet trim, and a melon-seed handbag—are included. Debbie O’Neill knitted our bag from the original instructions, which are below exactly as they appeared in Needlecraft. She used two skeins of Brown Sheep’s Waverly Wool, 100% Persian wool yarn, in #5113 Light Green (www.brownsheep.com) and size 9 needles to make the knitted bag. Happy knitting! 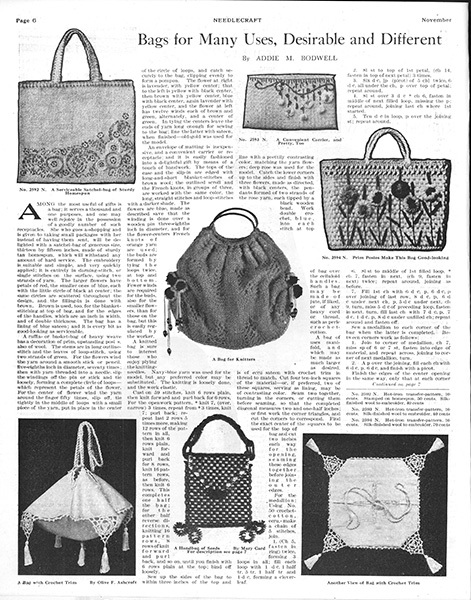 The page from the November 1924 issue of Needlecraft magazine, showing the knitted bag (center). 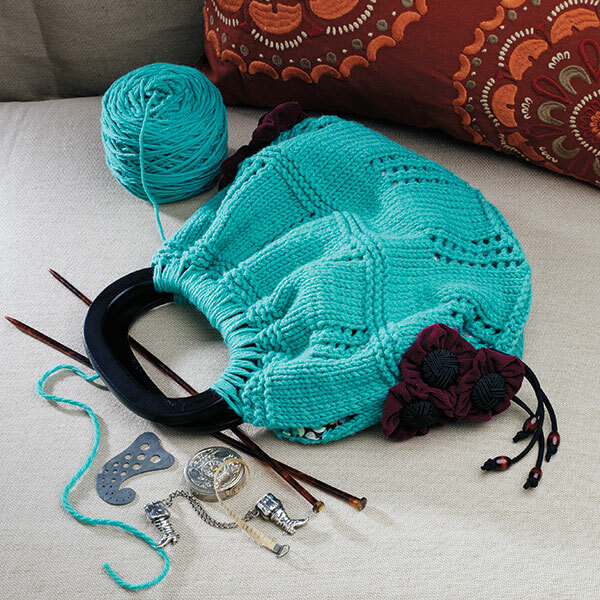 A knitted bag is sure to interest those who enjoy plying the knitting needles. Navy-blue yarn was used for the model, but any preferred color may be substituted. The knitting is loosely done, and the work elastic. 16 pattern rows, 8 rows of knit forward and purl back, and so on, until you finish with 6 rows plain at the top; bind off loosely. Sew up the sides of the bag to within three inches of the top and line with a prettily contrasting color, matching the yarn flowers; deep rose was used for the model. Catch the lower corners up to the sides and finish with three flowers, made as directed [see below], with black centers, the pendants formed of two strands of the rose yarn, each tipped by a black wooden bead. Work double crochet, blue, into each stitch at top of bag over the celluloid handles. Such a bag may be made of jute, if liked, or of any heavy cord or thread, such as perle crochet cotton. 1924 issue of Needlecraft magazine and Brown Sheep’s Waverly Wool, 100% Persian wool yarn. Photo by Joe Coca. Faux tortoise knitting needles, boot-shaped silver knitting guards, embossed metal tape measure, and cornucopia-shaped knitting gauge courtesy of Loene McIntyre. In the original instructions for the bag, there is a notation saying that the flowers should be “made as directed.” The directions are in the instructions for the embroidered raffia bag (No. 2594 N. in the right column of the original page from the November 1924 issue of Needlecraft). They are printed below exactly as they appeared in the original. No information on the tassels or beads was provided. A raffia- or basket-bag of heavy weave has a decoration of prim, upstanding posies, also of wool. The stems are in long outline-stitch and the leaves of loop-stitch, using two strands of green. For the flowers wind the yarn around a smooth stick or pencil, five-eighths inch in diameter, seventy times; then with yarn threaded into a needle, slip the windings off the pencil or stick and tie loosely, forming a complete circle of loops—which represent the petals of the flower. For the center of flower wind the yarn around the finger fifty times, slip off , tie tightly in the middle of loops with a small piece of the yarn, put in place in the center of the circle of loops, and catch securely to the bag, clipping evenly to form a pompom. Cut 6 circles, 5 to 6 inches (12.7 to 15.2 cm) in diameter, out of chosen fabric to make six yo-yos. In the center of each yo-yo, with gathered side facing, sew on a large fabric-covered button. Cut a length of suede cord, about 11 inches (28 cm) long, and place a wooden bead on each end and secure with a knot. Fold this fringe in half and sew one to the back of each yo-yo. Sew three yo-yo flowers to each side of the bag as shown in the photograph. 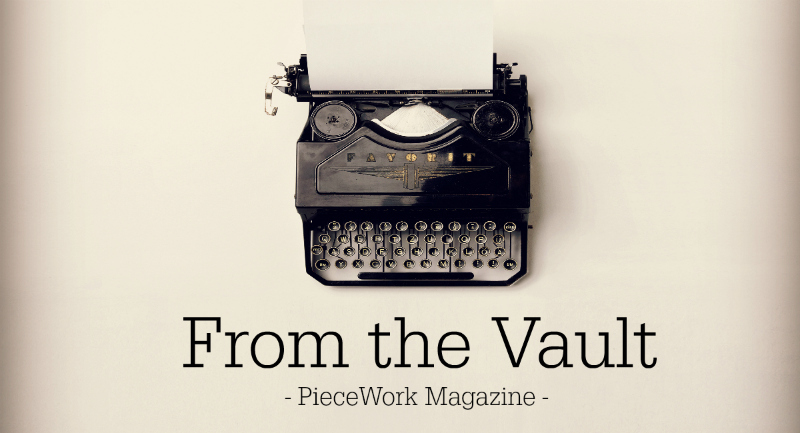 Find more historically inspired knitting projects inPieceWork!